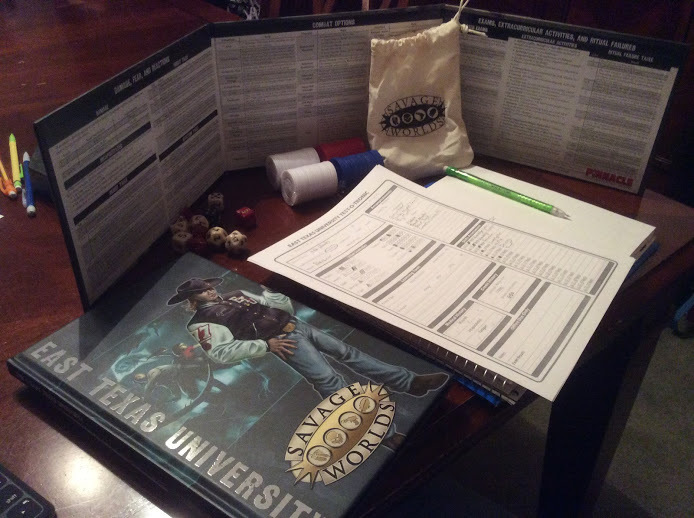 I can't believe it's been nearly a year since our last game of Savage Worlds East Texas University! Back when everyone in the team lived in Pennsylvania, it was so easy for us to connect once a month... but then Emily had to go and move to Ohio, just so that she could leave all of us great gamers behind. With all the planning this week for Friday's Deadlands Reloaded Actual Play, I knew that I would be strapped for East Texas University adventure prep time. We don't meet often enough to justify dipping into the Degrees of Horror plot-point campaign, and while I considered running a one-sheet, I fell into old habits and just broke out the ETU Adventure Generator. Nazi scientists, using a temporal rift generator [All Hell Breaks Loose], travel to the future in search of advanced technological marvels to help the Third Reich [Secrets]. Unfortunately for the Nazis, their rift opens up in the middle-of-nowhere Texas [Pinebox Environs - Wilson Quarry]. Hoping to still gain some insight, they learn about a store called Best Buy, and hatch a plan to hijack delivery trucks and then offload the products through the temporal rift [Corporation]. The Nazis are using genetically enhanced Brutes as muscle and guards for this project [Supernatural Creature - Anomaly]. Best Buy has offered a $2,000 gift card to anyone with information that can help apprehend the culprits of the thefts. The biggest clue to what was going on was an accident scene along the main road that ran north from Pinebox to the Best Buy [Accident]. *Andy noted that according to the East Texas University Player's Guide the Edges "Beast Bond" and "Beast Master" were not allowed. Good thing for Jen that the GM is her husband. 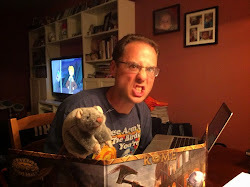 As with all of our games, last night went completely off the rails quickly. We opened up the session with the PC's sitting around in Cordelia's dorm room (Whitehall Co-Ed Dorm), watching a Firefly marathon. Cordelia still had a crush on Chaz, and was trying to learn more about the geeky arts. There was a brief discussion about trying to solve the case of the missing Best Buy delivery trucks, as everyone could use gift cards. Chaz was pretty pissed that his pre-ordered new XBOX One never arrived, furthering his interest. The study group decided that they needed weed. So we role-played the team digging through Cordelia's roomate's stuff only to find a business card for "Mr. Nice Guy." The herb was ordered, and delivered thirty minutes later, and since the delivery driver was kind of cute, Cordelia moved in for a make-out session in the back seat of a smokey old Lincoln Town Car. While the PC's were getting high in the dorm room, about halfway through the Firefly marathon, they glanced outside and saw a large, hulking figure by the creek. Of course, this required an investigation, so everyone grabbed their iPhones and went towards the water. Unable to make out the figure, Cordelia moved closer and extended a "hello". The humanoid, a Nazi Brute who was searching the area, opened fire! The fight with the Brute was a bit of a mess. Elle sent her Chihuahua Bruiser into the fray, nearly taking out the creature in a single hit! Cordelia and Abigail started wrestling with the Brute, attempting to take its gun. Ezra pelted the monster with rocks. Chaz took off his shoes, tied the laces together, and fashioned a Converse-Nunchuck with his MacGyver ability. Cordelia eventually called the police on her iPhone, and the Brute knew it was a goner after Abigail succeeded in the disarm. It pulled out its grenade and set it off, killing itself and injuring Abigail, Elle, and Chaz. That's when the cops showed up, arriving just as Ezra finished hiding the Kar 98 in the trunk of his car. You never know when college students will need some high-powered, WW2 weaponry! To role-play the police questioning scene, since it each witness would be separated from the group, I asked each player to write out their statement. This was when things got good... for the GM! Abigail: We were attacked by this giant zombie humanoid. It shot Cordelia and came after the rest of us. Eventually it blew itself up. Several of us sustained injuries in the explosion. Ezra: We were watching Firefly in Cord's room. Bruiser, Elle's dog, needed to "go", so we took him out. This thing in the H20 shot at us then blew itself to hell and hurt my friends. Elle: Some kid was dressed like a solider for Halloween and said he wanted to show us this cool fake grenade he got at the surplus store and when he reached into his pocket it blew up. Guess it was the real deal, yo! Boom, mic drop! Cordelia: Big guy with bad skin condition shot me and blew himself when my friends heroically confronted him. I bet you know what being heroic is like. You're all strong and muscular. Your girlfriend must be constantly smiling. Do you have a girlfriend? Chaz: Would you believe me if I told you that we got attacked by an undead Nazi with a rifle and grenade? No? Look, we got real high. I'm not sure what happened, but I do know something blew up in the river. So don't you people have bigger things to worry about right now? Chaz's statement got the entire study group a ride to the police station and a two day stay in jail waiting to meet with the judge on Monday morning. At least Elle's pre-law skills got the party "mostly" out of trouble. After a very compelling argument, Elle convinced the judge to let everyone go with nothing more than a fine. $1,000 per student would be tough to overcome, but it was a small price to pay. Cordelia got her dad to pay, but it cost her her car. Now the study group really needed some money, so they got back to the Best Buy investigation. Sort of. Chaz called the local Best Buy and started asking all kinds of weird questions about delivery dates of the next shipment. This, of course, brought the law back to ETU, as a detective showed up at Chaz' dorm room looking for information about the thefts. Chaz knew his goose could've been cooked, as he was also trying to hack the Best Buy system on his laptop. Fortunately, the computer science major was able to pass off his roommates computer as his own, and talked his way past the investigator. The study group met up later that afternoon and decided to take a drive up to the Best Buy. On the way, they noticed signs of a large vehicle crash along the side of the road. Getting out of the car to investigate, the vehicle had to have been a tractor trailer, and it could be tracked into the woods. Also, there were spent shell casings nearby matching the rifle in Ezra's trunk. The study group headed into the woods, following the trail left by the truck. They followed the trail all the way to Wilson Quarry, discovering a terribly bizarre scene down by the water. Three Best Buy trucks were parked adjacent to a glowing, swirling, red portal. Six Nazi scientists stood nearby, examining the Best Buy wares, while eight Nazi Brutes guarded the scene. The study group believed that they could destroy the portal by running it over with one of the trucks. Chaz and Ezra followed Abigail (one of the only characters trained in Fighting) as she charged the nearby Nazi Brute with a bayonet-toting Kar-98 in hand. With one strike, the geek gutted the beast in a stealth take down. Ezra and Chaz climbed into the cab of the truck and started it up. While this was happening, Elle took one of the Brute's hand grenades and directed Bruiser to go and drop it off in front of the Nazi scientists. Bruiser wasn't very stealthy, however, and the scientists noticed a small, bedazzled chihuahua running up to them holding a stick grenade in its mouth. The Nazi scientists pulled their pistols and shot Bruiser to tiny chihuahua bits! ... transporting the entire truck, and its three ETU college student passengers, into a Nazi lab in the 1940's! The whole reason that the trucks hadn't been transported was that they were too large for the temporal rift to accommodate. So when they came out the other side, they destroyed the gate device, locking themselves in the past. Obligatory Weird War II mash-up for the next session! "I saved a spot for you on the bed." - The creepy comments from Jeremy's character (Cordelia) to Andy's character (Chaz) were non-stop. "Look for a card that says 'Mr. Nice Guy.'" - Jen knows exactly how to find weed in Pinebox, Texas. "Guys, Big Foot shot me!" - Cordelia was quite surprised when the hulking thing by the creek opened fire. "Did you tell them about your shoe nunchucks?" - Ethan to Andy, asking about his character's interrogation with the police. "We could Ewok it!" - Chaz believed that the study group can dispatch the eight Nazi Brutes using rocks, sticks, and crude traps.